Angler's Haunt - Catching or fishing for Squid . One of the more interesting form of fishing is fishing for squid. Generally there is two ways to catch them, we can either scoop them from the sea or catching them using line and hooks. The former method is usually done by using a strong light source placed one or two feet off the surf, the effect of placing the light near the water is that it will attracts the most voluminous creatures in the sea, the plankton, to the surface of the water. These zooplankton in turn attracts small creatures and fish fries that feed on them. These in turn attracts the bigger predators, like bait fish fish and smaller fishes like the ikan bilis, which then attracts the bigger fishes, squid and cuttlefish to the surface to complete the food cycle. The biggest creature I ever seen attracted to such a spot of light was when I was fishing somewhere out in the South China Sea on a passenger liner. I was surprised by a whale shark that was almost 1.5 to 2 meters wide at the head and about 7 to 8 meters long. Even though I was about 15 to 16 feet off the water on the stern of a small passenger liner surrounded by half a dozen or more spotlights, it still gave me hell of a fright when something so huge suddenly appear out from the deep dark. Locally, and around the region the most common light source used by fisherman to attract squids are the pressure lamps, it uses kerosene and work on the principle of pressuring the fuel, heating up the fuel as it's ejected and burning the expanded fuel in a mantle. It's very very bright and in my opinion one of the cheapest and simplest technological items invented maybe a century ago that modern technology will still find hard to beat on the same economical basis and brightness output. The fisherman will hang these lamp over a pier, jetty or boat and wait for the squid to arrive. When the squid or cuttlefish appears, the fisherman will scoop up the squid quickly and always from its rear. Squid will instinctively jet backward when it's in panic mode or when it need to escape a prey or danger, therefore the fisherman will need to take such characteristic into account when targeting squid using the scoop. Catching Squid The Angler's Way! The alternative would be to use the hook and line method, there are two ways to this method too, you could either employed a baited rig or use a lure to catch them. 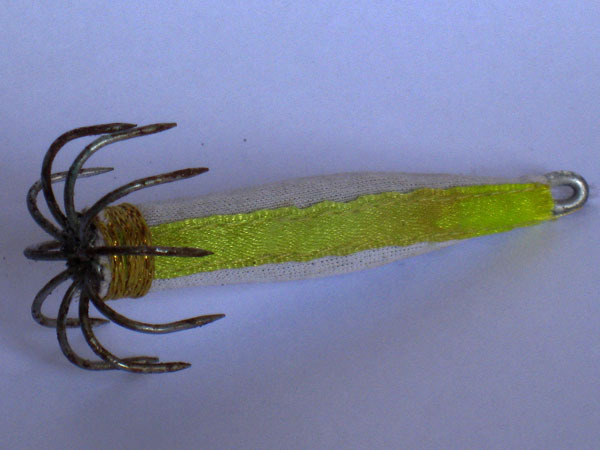 As show in the image, the squid rig use with baits and looks much like the ribs of an umbrella. The rig consist of 2 parts and there is the main shaft which you use to scewer the bait (usually a small fish or prawn) and at the other end you got the busines end of this rig the squid hooks which hold on to the squid when they strike. The hooks actually looks like the ribs of the umbrella and the aim is to hook the squid with these hook when it tries to grab the bait while the rig is in the water colum. Some rig comes with 1 or 2 layer of hooks but I have seen a couple with 3 layers. Is having more layer better? I really don't know, you've to try it to find that out for yourselves. To deploy the rig, the whole baited rig is lowered into the water column, the setup is usually secured using a line to a float to allow the rig to hang at a fix depth. How deep an angler would lower the rig would very much depend on the depth that the angler thinks the squid are. They could only be at a couple of feet below the surface or down at the bottom, hovering a feet or two off the seabed. The float will sink or bob around when a squid grab on to the bait, all you need to do is to haul the line in. When you do that the squid will try to jet away with the baits, do make sure there is a constant pressure on the rig against the squid, that is needed because the hook of most rig does not have barbs like a normal fishing hook, so if there isn't a contant pressure on the point of the hooks on the squid, the squid might be able to dislodge the hooks. On the other hand, do not exert too much force too. That because you do not know which part of the squid is caught on the hook, if it's just the tenticales thats caught (and thats usually the case), you do not want to rip them off the squid by pulling too hard. The other hook and line method is to use a squid lure. This lure is no different to those used for fishing. The most distinctive point is the umbrella ribs like hooks, and other is the weights that are attached to the lure on the bottom. There are lures that are without this weight that stick out externally, but wrap inside the lure itself to aid the lure in sinking. The lure is usually made of plastic and might or might not be wrapped in some textile material. The lure is normally in a shape of a shrimp or fish. 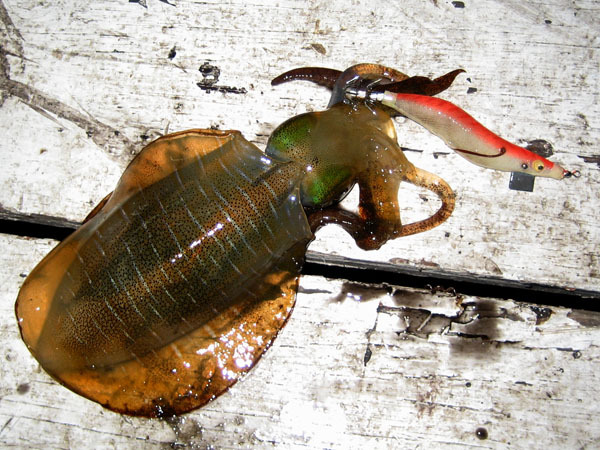 Squid lure are generally negative buoyant and can be used in mid water or at the bottom. It comes in different size (eg. 0.8, 1.0, 2.0 or 3.0 ) and any colour under the sun that you can imagine of. An interesting fact on squid is that they actually are not able to see colour like the way we humans do. But it is a fact that the squid and cuttlefish must somehow sense the colour of an object because their survival depends on their ability to camouflage themselves to their environment. Cuttlefish, octopuses and squid are from the cephalopods family and they have been known to use camouflage that copies the colour, background design and sometime every texture of their environment. Eg Corals and seaweed. The only way they can do that is with the ability to sense colour. So the colour of a squid lure does actually impact your catch rate. I have seen the impact of colour on catch rate and do believe that different colour and design do produce different results at different time, but there is no fix formula that I can easily understand or explain, my guess is that it's dependent on the clarity of the water, the amount of light (yes you can fish for squid in the day too), or maybe salinity & temperature of the water? 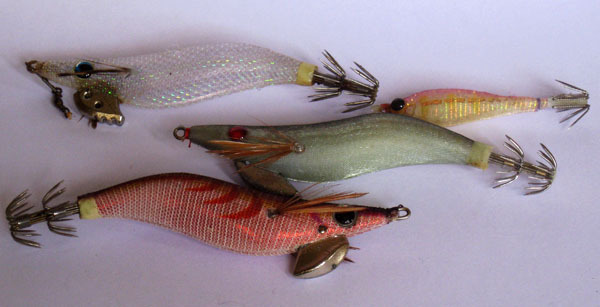 To play safe, I usually have a handful lures with different colour and design on all my egi-ing trips. And there you have it, I hope this write up have provided you some information on catching squid or stir your interest in giving it a try. Do note that catching squid is very addictive and once you catch your first one, you'll be hooked.